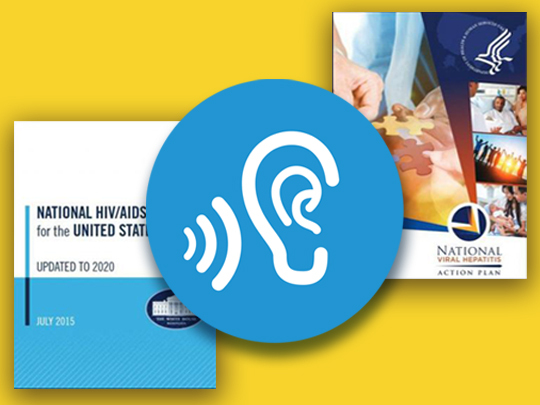 The U.S. Department of Health and Human Services Office of HIV/AIDS and Infectious Disease Policy (OHAIDP) is offering multiple ways for the public to take an active role in helping to develop the next iterations of the National HIV/AIDS Strategy (NHAS) and the National Viral Hepatitis Action Plan (NVHAP). Both national strategies currently expire in 2020. In-person Listening Session: On Friday, February 22, 2019 from 11:00 a.m.–1:00 p.m. (ET) in Room 800 of the Hubert H. Humphrey Building, 200 Independence Avenue, SW, Washington, DC, 20201. RSVP by Thursday, February 14, by sending your name, title, and organization to HepHIVStrategies@hhs.gov. Comments must be received no later than 5:00 p.m. (ET) on March 11, 2019. Please allow sufficient time for comments to be received before the close of the comment period. All the input gathered from the listening sessions and responses to the RFI will be shared with our federal partners, who will use it to develop the next iterations of both strategies, as well as each agency's actions for implementing them. We look forward to receiving your ideas and input! Read more about the National HIV/AIDS Strategy. Read more about the National Viral Hepatitis Action Plan. Read more about the update process on the HIV.gov blog and on the HHS viral hepatitis blog.